Holiday Barn Pet Resorts has been a part of the Richmond community for more than 45 years. It’s impossible to stay in business that long by having bad business ethics and client care. We work hard to make sure our guests are safe and healthy. Because of our efforts, we maintain a wonderful customer base. Still, many people are reluctant to board their dogs. The reputation of many competent and professional boarding kennels has been tarnished over the years by a few careless business owners who in the past failed to provide adequate care to their clients. The resulting apprehension has prevented many people and pets from benefiting from all that a resort like ours can provide. Today, pet owners in need of pet care have been forced to reexamine their beliefs and fears pertaining to boarding their dog or cat. Pet owners are beginning to recognize that knowledgeable and experienced boarding kennels provide the most dependable, secure and safe pet care available. Still, questions exist. After all, people are hesitant to trust others with such a beloved member of their family. At Holiday Barn Pet Resorts, we understand those fears. We too love our own pets and want only the best for them. Places like Holiday Barn Pet Resorts are considered “collectives”, or “community areas” for pets. It’s a place where many different types of pets all come together for some type of pet-related service. Aggressive cleaning of the environment in a collective space is crucial as well as controlling the intermingling of pets. But equally important is taking preventative steps before the pet ever enters a collective space in order to keep them healthy. Therefore, we have stringent vaccination requirements in order to decrease the chances that our guests will experience these illnesses. Additionally, our guests are checked frequently for signs of illness or distress, i.e., loss of appetite, coughing, lethargy, runny stools, etc… Any health abnormality is promptly reported to management and acted upon accordingly. Lastly, good ventilation, dry, clean bedding, and comfortable air conditioning and heat all combine to make for the healthiest environment for your pet. Just as your child is at risk of picking-up sicknesses at daycare, your pet becoming ill in the company of other pets is still a possibility. However, please take comfort in knowing that we have taken the necessary precautions and are doing all we can to assure that does not happen. We have several different types of accommodations for pets, none of which are a “cage”. All accommodations are private, with exception to doggy “siblings” who wish to share a room. For dogs, we offer three types of lodging: Luxury Suites, Cottages, and Deluxe Doggie lodging. Suites are perfect for discriminating canines who prefer all of the comforts of home. Each suite is tastefully decorated with color televisions and comfy beds. The rooms are approximately 6 x 8’ and most have windows with pleasant outside views. Dogs staying in our suites get to outside to stretch their legs 5 times a day during potty walks. Our doggie cottages are also quite large, offering a bright and airy space. 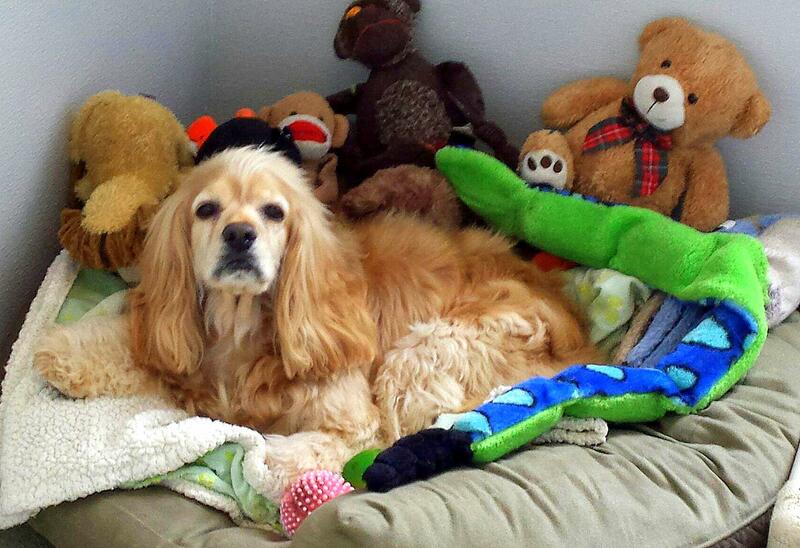 We’ll give your dog a freshly laundered, comfy bed or thick fleece blanket daily. He’ll feel right at home. Cottage guests also are walked 5 times per day. Dogs love our Deluxe Doggie Lodging as it provides them with a comfortable sleeping and eating area with their very own long private patio for stretching their legs and attending to nature’s calls. We’ve gone all out for our feline guests. They have beautiful and spacious multi-level “condos”. Special features include a private hidden potty place, a built-in aquarium with moving fish, and multiple windows looking outside or into the lobby where they can enjoy all the activity. The newest trend in boarding is offering a “cage-free” environment where all of the dogs stay and sleep together in one large room. It sounds very appealing to the customer who is comforted by the thought that their dog will be lonely when boarding alone and that the other boarders will give them company. Through our knowledge and experience with animal behavior, we believe that cage-free boarding presents more problems than solutions. Holiday Barn Pet Resorts does not offer a cage-free option. Canine behavior is not conducive to full, cage-free boarding. While we fully acknowledge the importance of socialization, our daycare provides this need during the day. It isn’t healthy for dogs to be able to play uninterrupted all day… even our daycare has scheduled time-out for independent rest. It’s important to provide a balance of activity and rest. A normally social dog who is overly tired or stressed will be less tolerant of other dogs and could act-out aggressively when he is not able to have some “down” time. Simply being away from home and his normal day-to-day schedule can be a stressful time for a dog. The risk of acting on that stress is higher in a cage-free environment. Resting, sleeping, and eating is of better quality when in private. It is much more relaxing to your dog to go to his own room, with his own bedding, surrounded by his own things at the end of the day. We have found that pets love the excitement of a pet resort. Other pets coming and going, interacting with the staff throughout the day, and enjoying one-on-one or group activities… it’s all very stimulating for them. Although it is our pleasure and responsibility to provide love and attention to each pet, many times they are far more interested in all the sights and sounds of their new world. Our activity selection is guaranteed to satisfy your pet’s need for attention. Many of our “play packages” provide one-on-one time with a pet lover like yourself. Your dog may choose to play catch, enjoy an “exploratory” walk, or simply stretch out in the sun for some belly rubbing. Many of our guests just want snuggle time, and we also have evening tuck-ins for the ultimate spoiling. Of course, she will miss you. This is one point that we cannot contest, but, the degree to which she “suffers” due to your absence is still not totally proven by science. What we know from having dealt with dogs and owners parting ways in our lobbies at Holiday Barn Pet Resorts, is that many dogs are more “dramatic” at that moment of separation from their owners, but behave excitedly and happily when their owners are no longer in sight. Dogs live in the moment. So, that moment mom walked away was pretty awful, but hey, look at that squirrel! And cats? Well, the issue of whether or not a cat misses their owner is one of much debate. Recent studies conclude that cats could care less if their owners are there or not there. From what I have read, I think it depends on the cat. Sure, they’re independent, but cats love their people too. I think our absence from them creates more of a “concern” than a “longing” in our feline friends. I think they kind-of switch into self-preservation mode and any signs of attachment to their owners is merely masked. We hope we have addressed some of your concerns and that you will be able to confidently make the decision to bring your pet to Holiday Barn Pet Resorts for a vacation! Come take a tour of our locations in dog boarding facilities Glen Alenn and Richmond beforehand, and see how much fun our guests are having. We are available for tours every day between the hours of 10:00AM – 3:00PM. Error: Error validating access token: Session has expired on Monday, 29-Oct-18 09:08:51 PDT. The current time is Thursday, 18-Apr-19 20:12:04 PDT.